Easter would not be Easter without Cattleya skinneri. This delightful small-flowered Cattleya species always produces an abundance of bright rose-lavender flowers in time for this spring holiday. It is as much a part of this holiday for me as daffodils or the traditional Easter lily. Because it is so easy to grow and flower, C. skinneri is one of the most rewarding of nature’s spring-flowering orchids. Cattleya skinneri is native to Central America, where it thrives in wet mountain forests from just above sea level to about 4,000 feet (1,220 m). Its growing range begins in southern Mexico and extends through Guatemala and Honduras into El Salvador, Nicaragua and Costa Rica. It is one of the most common orchids found in Costa Rica and is so popular there, it has been named Costa Rica’s national flower. Throughout the area, you can find plants growing in many gardens in the towns and cities, on porches and patios, fastened to trees, on tile roofs, or forming dense masses along the tops of adobe walls. Whole trunks of sabal palms can be seen covered with plants, put there by their owners to produce a colorful display for the religious holidays. Cattleya skinneri is usually referred to as a bifoliate Cattleya because of the two leaves that adorn the top of its pseudobulb, but, more importantly, its flowers have an entire lip — in other words, one that continues all the way around with no cuts in it as you have with Cattleya intermedia or Cattleya guttata. In this sense, C. skinneri is similar to the autumn-flowering species, Cattleya bowringiana and Cattleya deckeri. Like C. bowringiana, C. skinneri has a limited range of color forms, and most plants have rose-lavender sepals and petals with a darker lavender lip, and the lip has a white throat. There are, however, some semi-albas and albescens forms that are quite striking. The rarest and probably the most beautiful form is the true alba, which has glistening white sepals and petals and a white lip with a pale yellow throat. The true alba has no trace of lavender color anywhere in the flower. Cattleya skinneri produces from five to 12 flowers on a spike and usually has more than one lead even on a small plant, so the result is a marvelous display of flowers. The flowers are somewhat larger than those of C. bowringiana, normally measuring about 4 inches (10 cm) across, although some can be as large as 5 inches (12.5 cm). Cattleya skinneri was one of the earlier of the Cattleya species discovered, appearing in 1836 — just after Cattleya mossiae. It was described as a new species in 1837 by the English botanist James Bateman in his book The Orchidaceae of Mexico and Guatemala (Tab XIII). Although Bateman had never been to Mexico and Guatemala, he was the world authority at the time on the orchids of these countries because of a man named George Ure Skinner, who ran a trading company in Guatemala. When Bateman was still a student at the Natural History Museum at Manchester, England, he noticed specimens of birds and insects Skinner had sent to the museum. He wrote to Skinner asking if he would send him specimens of orchids, and Skinner responded enthusiastically, sending box after box of plants he collected in the local countryside. At times, so many plants arrived that the commercial orchid company James Veitch eventually set aside a whole greenhouse exclusively for Skinner’s Central American orchids, and every private collection in Europe soon had a plant of C. skinneri. Skinner continued to seek out Central American orchids for Bateman for the rest of his life and the two developed a lifelong friendship that is one of the most famous and productive in orchid history and led Bateman to write what is often considered his best work, The Orchidaceae of Mexico and Guatemala. Virtually all the orchids Skinner sent to Bateman were new to European horticulture and both John Lindley and James Bateman described them as new species. 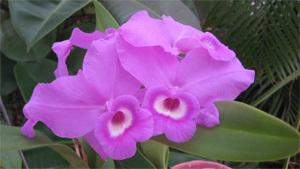 Because of his dedicated efforts, Skinner was honored by having his name appear on Barkeria skinneri, Lycaste skinneri and Bateman’s favorite, Cattleya skinneri. Of all the Central American discoveries, Bateman considered C. skinneri the best. The high esteem in which C. skinneri is held by orchid growers is demonstrated by the awards it has received over the years. 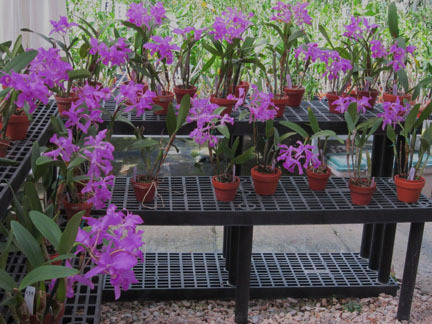 Fine clones of C. skinneri have received more than 40 awards from the American Orchid Society alone. Two of the best lavender clones — ‘Heiti Jacobs’ and ‘Carpinteria’ — received First Class Certificates and there are numerous lavenders with Awards of Merit. An albescens clone, ‘Debbie’, also received an FCC/AOS because of its excellent form and large almost-white flowers. Because it produces plants with so many leads and such an abundance of flowers, C. skinneri also has a host of Cultural Commendation awards to its credit, and has been one of the most popular orchids exhibited at spring flower shows. In the early days of orchid hybridizing, C. skinneri was crossed with many of the other Cattleya and Laelia species, plus Brassavolas, Epidendrums and Schomburkias, but none of these crosses produced anything as famous as C. bowringiana hybrids like Cattleya Portia. The popularity of small Cattleyas today, however, continues to make C. skinneri a useful parent in modern commercial crosses. One of the earliest and most beautiful C. skinneri crosses and one that is still remade by commercial growers is its hybrid with another Central American Cattleya, the orange-colored Cattleya aurantiaca. The hybrid is called Cattleya Guatemalensis and it is also a naturally occuring hybrid between these two species. A fine clone of C. Guatemalensis has flowers that look like C. skinneri for size and shape, but capture some of Cattleya aurantiaca’s orange hues, giving the flowers a touch of coral, salmon or rosy-pink. The full range of color in C. Guatemalensis includes orange, purple, yellow and red, although plants with these more brilliant colors seem to exhibit more characteristics of the C. aurantiaca parent than C. skinneri with narrower petals and smaller flowers. Easter is a perfect time for orchids — particularly when the orchids are Cattleya skinneri. The sun is higher in the sky now and the bitter winds of winter are just a gently moving remnant of an April shower. The greenhouse has become the warm tropical climate of an Andean summer day, and C. skinneri is in flower everywhere. Cattleya skinneri is the orchid that makes spring sparkle, and it is too bad we can enjoy it only once a year. Cattleya skinneri is one of the easiest of the Cattleya species to grow. It is a vigorous plant and usually produces multiple leads, so you can develop it into an exhibition plant with very little effort. In the United States, C. skinneri normally begins sending out new growths in late summer and will complete these by late autumn or early winter. If you encourage the plant to begin growing a little earlier with frequent light sprays of water in late June, it can make two growths a season and bloom on both of them. Once a growth is mature, the sheath will turn brown and buds will develop and emerge from the dried brown sheath in time for it to flower in late March into mid-April. The flowers will last in bloom three to four weeks under normal home conditions — a little longer at cooler temperatures of 55 to 60 F (13–16 C). After blooming, the plant should receive less water and be allowed to rest for a couple of months. Like most Cattleya species, C. skinneri needs lots of sun and moving air. A night temperature of 58 to 60 F (14–16 C), and a day temperature of 85 F (29 C) suits it well.